 A bright, breezy, and opinionated look at how the Food and Drug Administration has handled and mishandled its job in the past decade. A fiction writer (Brain Damage, 1992) as well as an investigative journalist, Burkholz has a novelist's talent for spinning a good tale. He calls the shots as he sees them in this exposÇ, which describes the FDA as bumbling, the pharmaceutical industry as avaricious, and the Reagan administration as placing the law of the jungle over the law of the land. Burkholz sketches a brief history of the FDA but concentrates on the 1980s, a decade in which White House antiregulatory policies combined with the agency's own inherent weaknesses to render it inept. The heroes of this tale are consumer advocate Sidney Wolfe and US Representative John Dingell of Michigan, both of whom have kept a sharp eye on the FDA for years, and just possibly David Kessler, the agency's head since 1990. 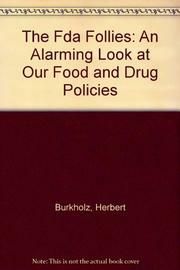 Among the follies Burkholz details are the generic drug scandals, in which some drug companies bribed FDA employees to give them preferential treatment; the agency's failure to protect consumers from such harmful devices as the Dalkon shield, the defective Bjork-Shiley heart valve, and silicone breast implants; its inability to prevent adulterated foods from entering the country; and its failure to stand up to U.S. food manufacturers making questionable health claims for their products. Although he credits the FDA with having changed under its new chief, pointing to its willingness to admit past errors, expedited procedures for approving new drugs, and additional measures to protect the nation's blood supply, the author concludes on a skeptical note. He has no faith in the civil service system, he announces, and doubts that the public can be adequately protected by anyone who cannot be fired for doing a bad job. Light and lively fare--containing just enough facts to satisfy.